We received an email this week from Lyndsey from Oxfordshire, who is looking for her lost dog. Here is what Lyndsey said – maybe you could help her? 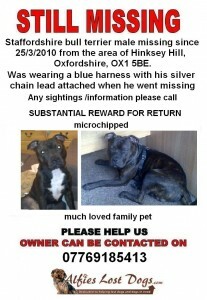 My dog went missing on 25th March from Oxfordshire. We have had no sightings, no news, and after all this time we are certain someone has him and are trying to keep him. He is about 20 months old, dark brindle, small bit of white fur on back right paw. He isn’t neutered and is very friendly. We believe he is microchipped, however there is a chance he isn’t. He has a Facebook page which has over 3,000 members, lots of pics and contact information. He has been in the Oxford Mail (paid advertisement), and they have done a story on him, he was mentioned on the radio once, but no-one else will help us!! We are desperate to get him back home, and are trying to advertise him everywhere possible. He has been gone for so long! He’s on doglost, and just about all websites, and he has a crime reference with the Police. If you can help, please contact Lyndsey on 07769 185 413.